The Madman’s Daughter was the creepiest debut I read in 2013. I mean, the opening scene is the vivisection of a rabbit. It doesn’t get much creepier then that! I had high hopes for the sequel especially when I heard that it would be loosely based on The Strange Case of Doctor Jekyll & Mr. Hyde. 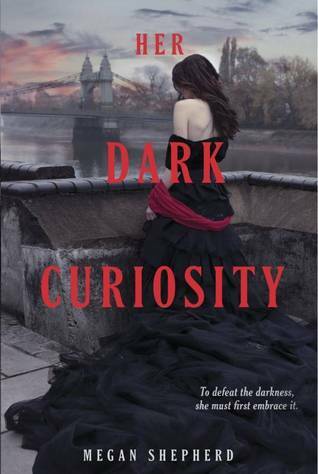 Her Dark Curiosity begins a year or so after Juliet returned from the island her father was living and experimenting on. The events changed her in a lot of ways and I loved seeing how her character handled all of the things she saw now and how that has affected her returned to London. I really liked Juliet in The Madman’s Daughter and I came to like her even more in Her Dark Curiosity. In this novel she must come to terms with both sides of her personality her animal side and her human logical mind. It was a fun dichotomy. One thing I wasn’t too keen on was the resurrection of the love triangle from book one. I thought with the death of Edward, then Montgomery pushing her off in a boat, that Juliet would get some time to herself. Unfortunately, that isn’t how things pan out and I think the back and forth took away from the interesting bits of the story. I did love the Jekyll and Hyde aspect to the story though. Any problems I had with the love triangle were completely overshadowed by how much I enjoyed this exploration of character. It wasn’t just Edward either Juliet also has a huge Jekyll and Hyde complex. Overall, I enjoyed Her Dark Curiosity. I thought it was a great continuation of The Madman’s Daughter and the ending set the story up for an epic finale which will deal with Frankenstein! I so can't wait to read this book. The Madman's daughter was one of my favorites of last year. Its coming out on audio on the 28th this month, its on my for sure list. great review.